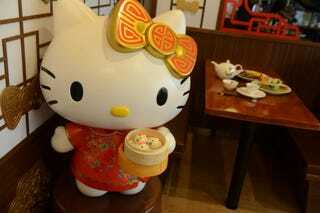 According to Sanrio, this is the first Hello Kitty restaurant of its kind in the whole word. The restaurant is opening this month in Hong Kong and offers an array of food shaped like the iconic cat character. Most of the dishes look like Kitty-chan inspired dim sum, putting a cuted-up spin on Cantonese food. There are also rice and noodle meals. This isn’t the first Hello Kitty restaurant in the region. In neighboring Mainland China, for example, there is a Hello Kitty Dreams Restaurant, which is very, very pink.